The University of Stirling opened its doors to its first intake of students on Monday 18th September 1967. The 164 undergraduates and 31 postgraduates were welcomed into the brand new Pathfoot building where all lectures took place and the library was temporarily located. On the evening of the 18th September staff and students celebrated the opening of the university with a dinner dance and firework display. Staff and students celebrate the opening of the new university, 18 September 1967. The following morning students met the academic staff in more formal surroundings at registration and lectures began at 8.30 am on Wednesday 20th September. For the university’s first group of undergraduates the most popular subjects were Sociology, Psychology and English. An early class in Pathfoot Lecture Theatre. 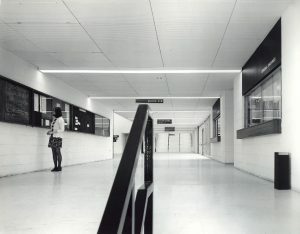 The new Pathfoot Building, 1967.